In this article you are going to learn how to use Reply Email Validation service and why email verification is important to your campaigns. This article describes how to use the Reply Email Validation Service. The Email Validation service lets you verify prospects' emails on deliverability, bounce rate and other criteria. This helps you increase campaign performance as well as reduce the chance of getting noticed by spam filters. Log in to your Reply account. Select prospects you want to validate. 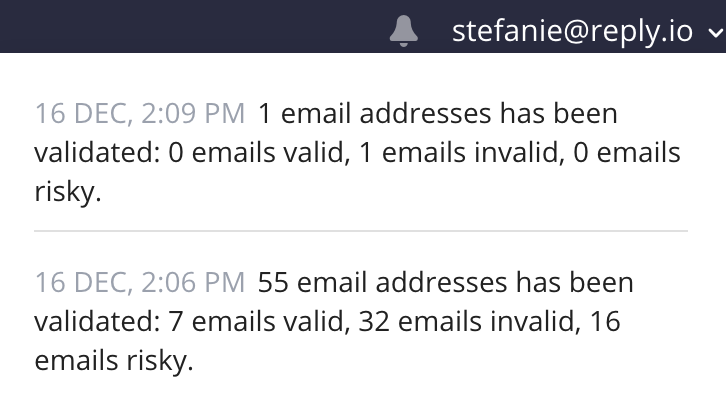 Note: you can validate only one batch of emails the same time. After you have selected email addresses and clicked Validate email, and want to validate additional email addresses, you must wait until the first batch gets validated. Note: Reply will not send emails to prospects with invalid emails. This is done to reduce bounce rate. For more information about the Email Validation core features and how it works, see the following article. To begin using the Email Validation Service, you must buy email validations. To do this, navigate to the Settings Page, Plans & Billing tab, Email Validation section.